Headquartered in Seattle, Washington, Amazon has become today one of the finest examples of e-commerce platforms. The internet-based shopping platform is best known to deal with a huge number of options such as fashion, stationeries, music, lifestyle-related items, and almost everything. Also, it has offered its services in cloud computing. Hence, when you have the application Amazon installed in your smartphone, you can enjoy a huge number of deals. When you are talking about Amazon, you cannot forget about the Kindle. The e-book gadget kindle is introduced by Amazon in order to provide an added comfort to people who love reading. You do not have to carry so many books together when you have Kindle in which you can have a numerous number of e-books downloaded. This has also led to amazing growth in the publishing of the e-books lately. So, why the name ‘Amazon’ is selected? It is said that Jeff Bezos, the former hedge fund executive of the Wall Street and the founder of the platform wanted a name that started with the first alphabet. Also, there are some other people who say that the name has got some connection with the Amazon River, the vast river of South America. So, what is the logic in it? The river Amazon is known for its hugeness across the world and the company was expected to spread out in the same way. Also, the first alphabet would help the company to be on the top always. The concept of Amazon.com was similar to the Silicon Valley bookstore, to sell books initially. The concept of Amazon was quite clear. They offered the benefit of delivering any book to any customer and at any location. Jeffrey P. Bezos established Amazon in the month of July of the year 1994. It was just in the year 1995 when the company went online and became Amazon.com. As estimated by the founder, the company came to be known quite soon because of the alphabet ‘A’ as the name’s initial alphabet. They started with books and this made them quite famous among their consumers. Though the company attracted attention since its launch, the first huge profit was earned during the last quarter of the year 2001. Have you ever noticed the logo of the company? You will find an arrow running from the alphabet A to the alphabet Z in the name. This means that the company is able to offer you almost everything that starts with the alphabets A-Z. Also, the arrow forms a smile and this denotes that the company not only can offer you almost every item but also they offer you with great customer service and satisfaction. The Amazon shares was opened up for the public in the year 1997 with the symbol AMZN. Initially, the price of the company was $18.00 for a single share. After that, in the last 10 years, it has seen a consistent rise in the prices and presently it is somewhere around $170.00 per share. The climb in the profit was noticed since the year 2008 and now they have a target of reaching till a target price of $400 per stock. Hopefully, they will soon reach out to the target, noticing their consistent growth in both stock price and popularity. Amazon.com first started with books and it hardly had the concept for consumer products previously. The founder stated that Amazon.com was mainly a technology company and the main aim of the company was to simplify the consumer’s online transactions. There were so many financial critics who criticized the company and stated that they might not survive well in the bookselling marketplace in existence of other major bookselling chains. These critics seem to be correct even until 2001 when the company was struggling to come up in the forefront. Bezos always stood up against such critics and shared that it is important that a company should get big faster in order to succeed. He even printed the slogan ‘Get Big Fast’ on the t-shirts of the employees. Also, though the company did not see much of profit until the last quarter of the year 2001, the company’s consumer strength kept of increasing drastically. By December 1996, the company had about 180,000 consumers that increased to 1,000,000 by October 1996. As a result, the company’s revenue also noticed a huge growth. It was about $15.7 million in the year 1996 that rose up to about $146 million in the year 1997. Again in the year 1998, the revenue increased to $610 million. It was due to such huge success of the company that Bezos was awarded as the “Person of the Year” for the year 1999 by the Time magazine. Soon, the company started its expansion in other areas too. It soon started the Associates Program that allowed other websites to sell off their merchandise along with a commission from Amazon. In 1996, the program started with just one site and soon it rose up to about 350,000 sites by the year 1999. Soon, the company started selling just more than books such as music in the year 1998. The same year, the company also started its international operations in countries such as Germany and UK. By 1999, Amazon started up with many other items for sale such as toys, games, consumer electronics, software, items for home improvement, and many others. Though the company was growing aggressively, it was not able to enjoy much of profit. This was the time when the founder realized that just the private investors will be not enough for the growth of the company. 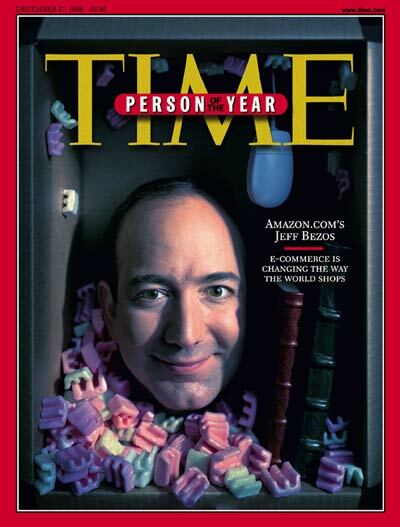 This is the reason Bezos decided to turn Amazon.com into a public company in 1997. This resulted in a rise of about $54 million in the NASDAQ market. Not just the company raised a huge fund in this way but also was able to use its stock in order to match up with the growth of the company. Though the company was already getting popularity due to the availability of so many consumers together at one single platform, what attracted the number of customers was the customer service offered by the company. The site came up with some of the amazing tools and strategies such as offering the display of similar items to the consumers based on the purchase history. Also, the option of ‘community of consumers’ was a great thing that allowed consumers to write reviews about the purchased products and this would help other consumers to know about different products and then make purchases accordingly. Bezos has been always quoting that Amazon.com is not mainly a platform for consumer retailing. So, finally, in 2002, Bezos showed off that Amazon.com is a technology company. Amazon Web Services was started that provided data for internet traffic patterns, and also offered statistics for various marketers. By the year 2006, the Web Services were expanded by the company with the help of Elastic Compute Cloud. In the same year, the company also started the option of Simple Storage Service. All of these services got instant hit in the market as the consumers got across the option of renting computer resources in place of owning them completely. The ‘Cloud’ service became famous and this was very much noticed by 2007. The storage service noticed about 10 billion objects and more. Soon after a time period of five years or so, it increased to about 905 billion. The popularity of the Amazon Web Services is very high. It led to the rivals of Amazon.com namely Netflix and many others to use this service. Initially, the concept of Amazon was not to deal with consumer products and hence keeping an inventory was not in the process. But when the company started selling various products, it became necessary to maintain inventories in their warehouses. Also, by the year 2000, Amazon.com allowed many of the websites to sell their items through it. This led to an increased need for fulfillment services. It was in 2006 when Amazon Fulfillment Services came up to handle even the inventories and other fulfillment options of the other websites. Due to increasing inventories and sales, Kiva Systems, the company offering inventory devices to Amazon also profited revenue of about $775 million in 2012. Though the company’s most profitable zone is the Amazon Web Services, the selling of various products also offered a huge amount of revenues for the company. It slowly started investing in many of the other retail sites. One of them is Zappos, the shoe seller that was bought for about $847 million in the year 2009. 2007 was the year when Amazon.com started its own sale of e-books. The popularity of these e-books increased so much that by 2011 the company came up with a tablet named as the Kindle Fire. This was quite a low budget tablet and the demand of the tablet so much in the market that by 2012. It was noticed that 50% of the tablets sold was Kindle. It was said that the way Amazon was selling books full-fledged during 1996, Kindle brought back the same era in the form of e-books. But soon there started a problem in between Amazon at the publishing houses such as Macmillan Books. Amazon.com wanted to sell the books at a price set by them that was quite low. This was not acceptable by the publishers. Hence big names such as Macmillan Books removed their stocks from both e-books as well as the store. Soon, the rift was solved out and Amazon.com allowed the publishers to set their prices on the books. This can be a possible reason why after the year 2010, the prices of the e-books saw a steep hike. By 2009, Amazon.com also started its own publishing line in the name of AmazonEncore. This is a very famous section where self-publication is the concept. Soon Amazon Publishing also started up. Though the number of publishers launching printed books on Amazon.com was still higher in numbers than on Kindle e-books, still it came up as strong competition in the market. There are so many interesting facts about Amazon.com that one may wish to know. A few of them listed here. • Though Amazon.com started with an all bookstore, but Jeff was quite sure with himself. He was sure that he would make a platform where almost everything can be available in Amazon.com. • Amazon was not the first name that was suggested for the company. Jeff first wanted the name “Cadabra’, but the lawyer of the company stated that the name can sound “Cadaver” over the phone and this can create confusion. Later Jeff also suggested the name Relentless but it also did not work. But even today when you search by the name Relentless.com, it navigates you to Amazon.com. Soon, after a lot of brainstorming, the name was finalized as Amazon.com. It is said that the company is named so after the world’s largest river. • It is said that initially, there was a bell in the office of Amazon that rang each time when a book was purchased. Everyone used to pop up to check whether the customer was someone new or an existing one. Soon, the bell started ringing so often that they had to remove it out of irritation. When an audit was done, it was noticed that Amazon sold books to not only 50 states but also about 45 different countries. • It was required that Amazon.com should order a minimum of 10 books from all the book distributors. This was a problem for the company. This may lead to loss of money as it was doubtful whether they would be able to sell off all the books. There was a book on lichens that all of a sudden was high in demand. It saved the company from getting bankrupt. • Initially, Jeff did not have an office for Amazon.com. Jeff, his wife, and one of the employees used to hold meetings in the store of Barnes and Noble. • Initially, the employees at the office used to work for long hours. It was said that there was no balance in between work and life. As per a story, one of the employees was so much tired working for months that he almost forgot about his car parked somewhere. After a few months he checked his email, he found parking tickets, warning from the towing company. Finally, he received an email claiming that his car has been sold out. • The number of staffs in the office was very low. Employees used to bring friends and relatives to the office for personal work. They used to sleep in their cars only. This is the reason, today, the company hires a number of seasonal workers during the festivals to keep the work smooth. • When eBay came up, Amazon.com also started auction site where it displayed the skeleton of a cave bear from the Ice Age worth $40,000. Though this idea was a flop in front of the competitor still Jeff loved this concept. • Jeff wanted to go really fast. This led to a number of confusion in the company such as the bulk of products, wrong packaging, and many others. • Soon, employees were divided into two teams to improve better communication & coordination between the employees. • The customers used to send a complain email directly to Jeff initially. Jeff, later on, used to forward this email to the team along with his comments. The team had only a few hours in hand to solve the problem. • Do you know Amazon started A9.com during 2004? This was a Block View, something similar to the Yellow Pages. It was in the year 2006 when Amazon dropped the idea of Block View. Soon Google came up with Street View by 2007. • The initial name for Kindle was Fiona. Later on, Jeff renamed the e-book reader tablet to Kindle. It became so much famous all across the world in a very short time. • Jeff Bezos was a difficult boss as said by many. He used to shout on his employees for any issues. He hired a counselor who helped him in calming down for this reason. There are so many such stories about Amazon.com. The company went through a lot of struggles to achieve the present position. The dream of Jeff has been accomplished now. Amazon.com is known to have almost everything from the alphabet A to alphabet Z in its store. Today, Amazon.com is a known site throughout the world and the popularity is increasing with the passing time. • The mission of the San Antonio Food Bank is to fight hunger in Southwest Texas through food distribution, programs, education, & advocacy. Amazon donated $75K to them, which serves families in need living in 16 counties in the San Antonio, Texas. • Homeward Bound, Arizona’s mission is to create pathways out of poverty for homeless families ready to make a change. Amazon donated $15K to them to help support the immediate needs of the homeless community in Phoenix. • IPS Education Foundation’s mission is to serve IPS students, teachers and classrooms through philanthropy. Amazon provided funding to the organization to support programs.